Digital is today everywhere and its possibilities are so wide that sometimes you can feel a bit lost. 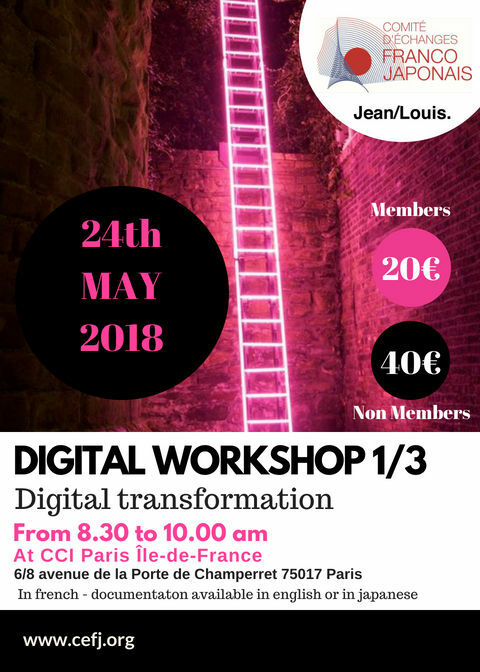 CEFJ and its member Jean/Louis, a digital strategy and communication agency will help you to understand digital keys. For this 1st workshop, we will explore digital marketing tools : digital branding, influencers power, e-RP or digital workplace. As France has a good place is this domain, what can we bring to japanese digital market which is known as technophile but not really digitized ? Jean/Louis. is a new type of communication agency, a mix of strategy, monitoring, creativity and an integrated media (creapills). They develop multichannel campaigns for advertisers, NGOs, start-ups and partners according to their own methodology : Reputation / Acquisition / Decision. Documentation available in english or in japanese. C / How to build an influence strategy ? be authentic !